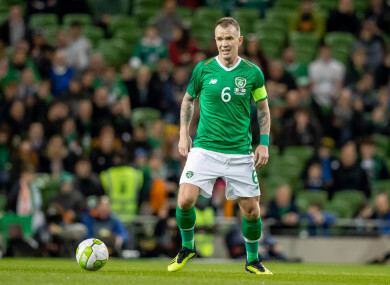 Glenn Whelan in action during his most recent Irish appearance against Northern Ireland. MICK MCCARTHY HAS made two changes to his Irish side for tonight’s Euro 2020 qualifier against Georgia. Matt Doherty and Sean Maguire drop to the bench, and are replaced by Glenn Whelan and Robbie Brady. The selection means Whelan plays in consecutive games at the Aviva Stadium, in spite of supposedly retiring after last November’s game with Northern Ireland. It has since become clear that was Martin O’Neill’s call, rather than Whelan’s. Robbie Brady starts having replaced Matt Doherty before the hour mark of Saturday’s game with Gibraltar, although he isn’t expected to play the full game owing to a lack of game-time with Burnley this season. Brady has completed a full 90 minutes just twice all season. Doherty drops to the bench following McCarthy’s post-game admission that including he and Seamus Coleman on the same flank didn’t work, while Sean Maguire also loses out following a below-par showing last Saturday. Shane Duffy, meanwhile, is fit to start after missing training yesterday with an ankle knock. It looks likely to be a 4-3-3 formation for Ireland, with McGoldrick leading the line between McClean and Brady; Hendrick and Hourihane will flank Whelan in midfield. Ireland have only ever failed to beat Georgia once in eight meetings, the outlier being a 1-1 draw in Tiblisi in September, 2017. Ireland are tonight looking for their first competitive win at the Aviva Stadium since beating Moldova a month after dropping those points in Georgia. If Ireland were to win and Switzerland drop points at home to Denmark, they would head into the next round of fixtures in June top of the group. Kick off is at 7.45pm, and the game is live on RTÉ Two and Sky Sports Main Event. Email “Glenn Whelan returns and Matt Doherty drops out as McCarthy names Irish team to face Georgia”. Feedback on “Glenn Whelan returns and Matt Doherty drops out as McCarthy names Irish team to face Georgia”.